For the paper's anniversary, I was charged with reimagining that very first front page, slotting the stories into today's layout and news priorities, and rewriting (and often expanding) each article in our modern style. 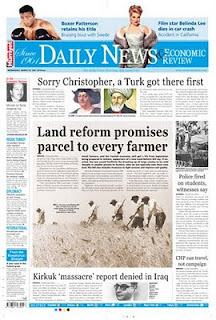 This package of articles, "The Daily News' First Day, Fifty Years Later," formed what we referred to as our "fake front page" today; the real one with 2011 news appeared on page 3. The online version has a nice juxtaposition of the 1961 and 2011 designs. I also wrote an essay for today's op-ed page, "Fifty Years of Fighting Typos," about the observations I made during this process and the continuing challenges of editing an English-language newspaper in a foreign country.